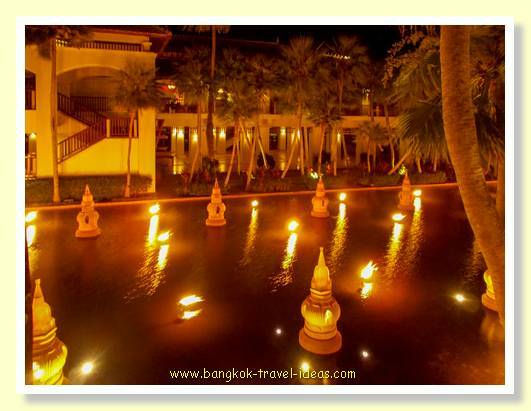 Want to stay in Phuket Thailand? Phuket is one of Thailand's most popular beach destinations and is a favourite with European tourists escaping the cold northern winter. 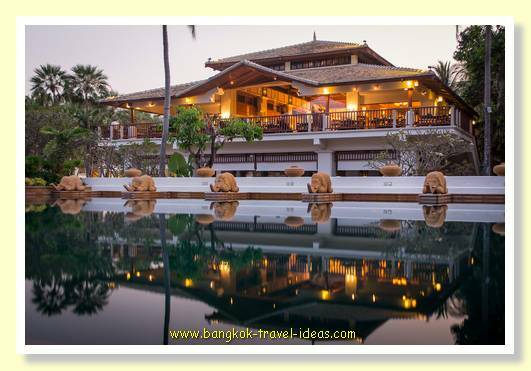 Generally speaking, the island of Phuket is extremely commercialised and caters primarily for overseas tourists. 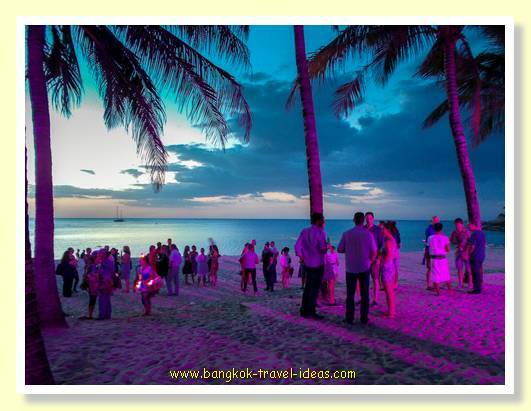 So if being in a sunny location with nice beaches where you can get pizza, German sausage and paella instead of traditional Thai food is what you want, then the beaches of Phuket could be for you. 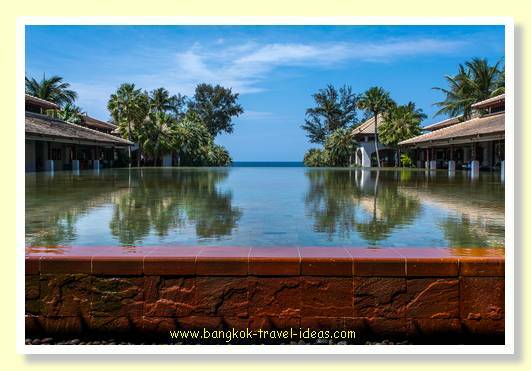 The island of Phuket is not cheap and in fact it is the most expensive of all the Thailand holiday destinations, but people love it and arrive in ever increasing numbers year after year. If your dream is to stay in Phuket and get some winter sun, there are some amazing resorts that offer all inclusive packages that are very appealing for well to do tourists. For those on a budget there are also lots of cheaper options that won’t break the bank. Scouting around the internet for the more remote hotels or travelling out of the peak season will provide the best bargains for the savvy traveller. Let me outline my recent trip to Phuket, which ranged from high flying accommodation at the JW Marriott Phuket Resort and Spa on Mai Khao beach, followed by basic cabin accommodation at the Bungalow@Mai Khao, taken on a TripAdvisor recommendation and then finally completing my stay in Phuket, with a fantastic experience at the newly built Novotel Karon Beach Resort and Spa. 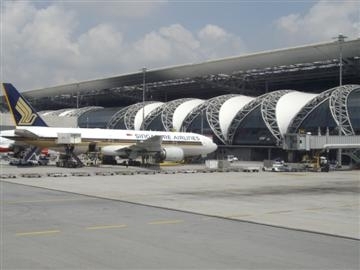 For those arriving in Bangkok at Suvarnabhumi Airport, it is a simple exercise to transfer from the International flight to a domestic flight, as both terminals are located in the same building. Immigration clearance takes place in Bangkok and Customs clearance of your checked baggage will take place at Phuket Airport. When you arrive at Suvarnabhumi Airport make your way to the Immigration area located at the end of Concourse C.
The transit desk staff should give you a yellow CIQ sticker to put on your shirt. Pass through immigration and go to the Domestic terminal. The CIQ sticker may help you remember to collect your luggage; it is also your entry pass into the International arrivals baggage area, so don't throw it away. After landing at Phuket International Airport, walk across the tarmac to the building and just follow the other passengers to the domestic baggage hall. 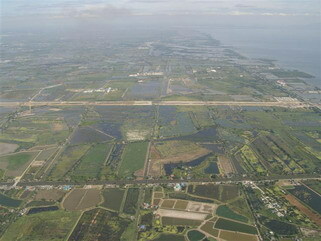 Phuket Airport is pretty small so you are not going to need any guidance to get around. Pick up your luggage from the domestic carousel or if you transferred from an International flight walk around to that area. Don’t go out the exit doors by mistake or you will waste valuable time trying to get to your baggage. Make sure you don’t exit Phuket airport before collecting your baggage, as your bags will come off on a different conveyor belt to the rest of the flight. Think on, as Grandma used to say. 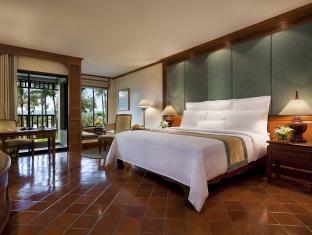 The JW Marriott Phuket Resort and Spa is located about 30 minutes’ drive from the airport heading away from Phuket town. The resort is fully contained and you could easily spend your entire stay here and not have to leave. This type of holiday suits many people, I know. 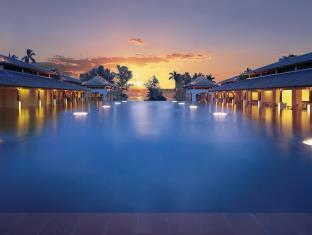 The JW Marriott Phuket Resort and Spa is located on one of Phuket's longest and arguably nicest beaches. 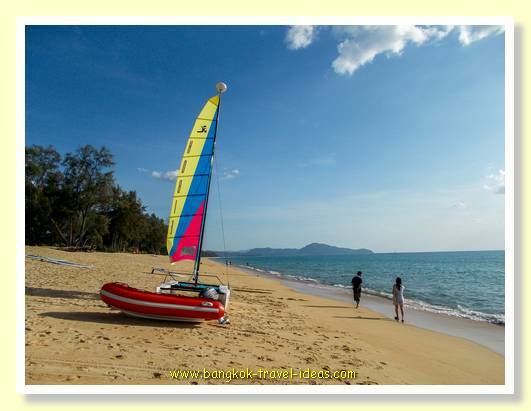 Mai Khao Beach is 10 kms of sand stretching from the Sarasin Bridge down to Phuket International airport. The promontory below is where the planes land at Phuket airport, you can see them coming into land, but you won't hear them. The rooms at the JW Marriott Resort and spa are well appointed and on a several of different levels, but you should expect to walk a couple of hundred metres from your room to breakfast. This level of spaciousness can catch some people unawares and so if you have mobility issues, advise the hotel at the time of booking so appropriate arrangements can be made. Overall the grounds are flat and if you can manage two half flights of stairs, getting around should not be too much of a problem. As far as shopping goes, there are a few shops on site serving the captive market and a small shopping complex on the entrance road. The JW Marriott Phuket Resort & Spa is not far from Phuket International Airport and located on the expansive and quiet Mai Khao beach area. Rooms are comfortable and well appointed and situated in landscaped gardens. All standard facilities expected from a high end hotel are available. From USD $299 BOOK NOW! Whether you like to laze around the pool or take a dip in the ocean, you are sure to enjoy yourself in this relaxing atmosphere, where service is only a call away. No matter what your reason to stay in Phuket, the JW Marriott Phuket Resort & Spa will make you feel instantly welcome. To start the day the breakfast layout is a splendid affair, with a range of treats to suit all guests. Take your tea, toast and scrambled eggs out onto the first floor veranda and marvel as the day begins to dawn and the last of the pool cleaning activity takes place. Laze around on the beach during the day or just relax in some of the many swimming pool areas. There are so many pools to choose from that you could literally sit around a different one each day. The hotel has its own massage and spa facilities, but if you just like a good old traditional Thai massage, then I suggest you use the small tents set out towards the beach area. There is nothing like being out in the open air with the smell of coconut oil whilst someone massages the knots out of your back and loosens up the legs. The hotel's aspect means that the sun sets across the water and so having evening drinks down by the pool area is a great way to end the day and enjoy an amazing sunset. Periodically there is a lantern lighting dance that performers demonstrate to the sound of a beating drum just as the sun is setting. This performance has to be seen to be believed, wait until you go or check out my video if you just can't wait. 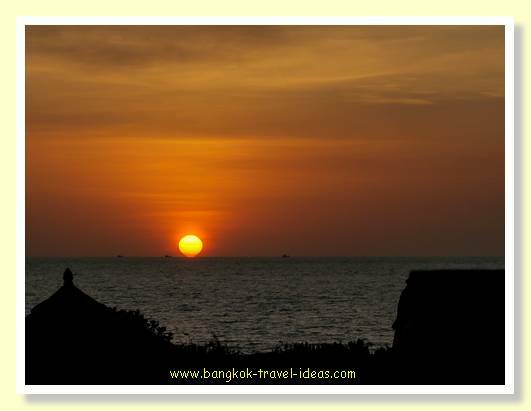 When you come to stay in Phuket with its amazing choices of sunset viewing locations. 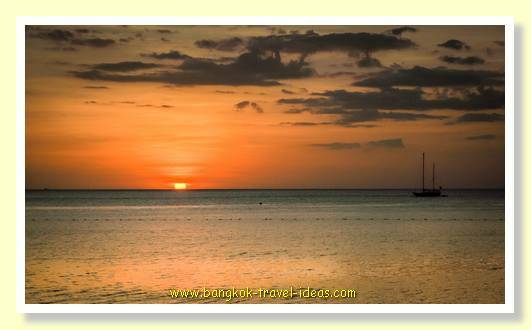 Makes sure you take time to enjoy watching the sunset from the sands of Surin Beach. With its seafront bars and back drop of coconut palms, the sunset at Surin Beach is an experience not to miss. Surin beach is located about 45 minutes from the JW Marriott hotel on the other side of Phuket Airport. There has been a recent amount of construction in the area but there is a nice bar and restaurant, though you should probably book as it gets quite busy. 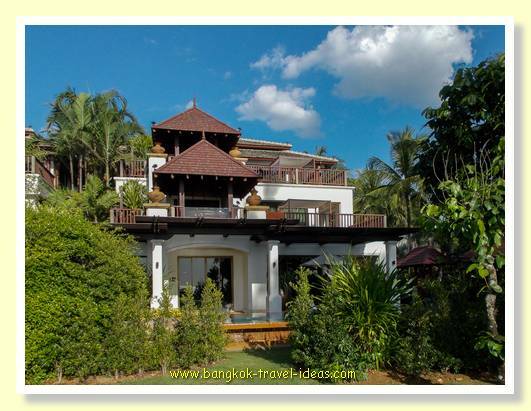 When you stay in Phuket be sure to take one of the excursions to the nearby islands. Day trips to the well known James Bond Island or even sunset drinks down at the popular waterfront should be on your itinerary.